I checked the rosemary I had been rooting and noticed that there were several small hair like roots on the stems. 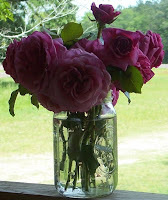 This meant it was time to get them out of water and into some soil so that's what I did! I'll be watching them closely for indications that they have taken root and are growing. 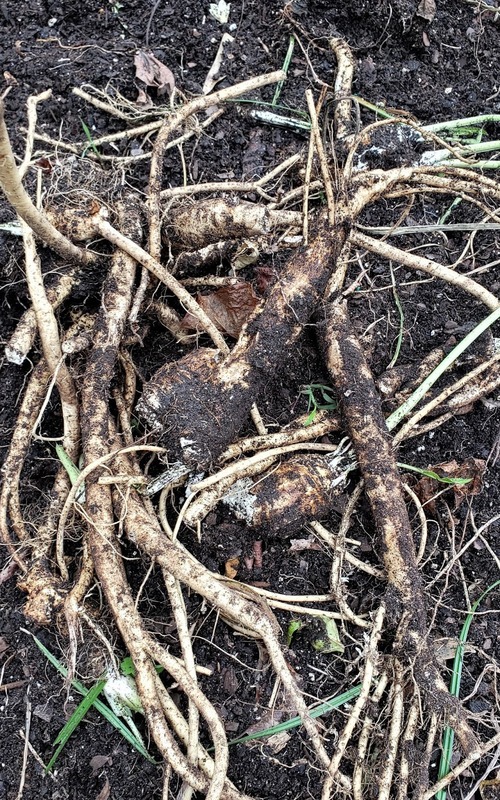 I harvested the horseradish I grew this year and replanted it again, along with some I had purchased. 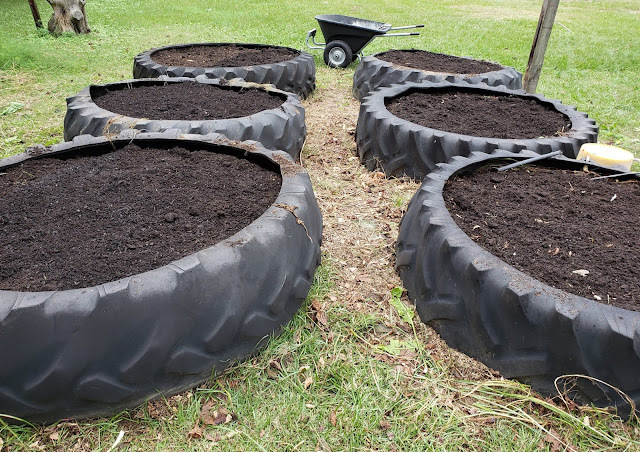 I finished cleaning out and planting our tractor tire raised beds: the three on the right, starting at the end nearest the wheelbarrow … ginger, garlic and garlic. The three on the left, starting at the end nearest the wheelbarrow … turmeric, asparagus and horseradish. I layered about an inch of soil on top of the plantings after I planted them to help insulate them for the winter. Not shown because I didn't get pictures: I moved my moringa plants into our greenhouse and I pinched the blooms and baby strawberries off our strawberry plants growing in our strawberry barrel. I have another day of 'fall harvesting/planting' to get done and then we should have our garden and raised beds ready for winter. Wish me luck!!! Glad to see you back. I wondered if you wrre sick. Lana, my mom has been critically ill but is doing better now! Glad to hear that your Mom is doing better! I guess i could look it up, but how do you plant your turmeric? Seed or root? I can't say I've ever seen it being sold for planting. Kris, turmeric for planting is turmeric that still has all the root and root hairs on it. And as for planting, I just break it apart leaving the roots intact and plant it about a half inch down, cover it and leave it alone. It comes up in the spring and starts doing its thing beneath the soil. Keep in mind that I live in an area where the winters are mild so it might be different in a colder climate. I've had great success for several years doing it this way. Where do you get your roots from? I am in SW Missouri. Some years we have a mild winter, sometimes not. 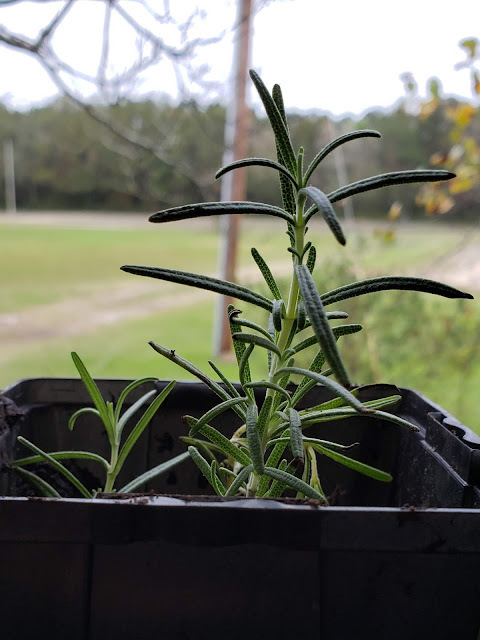 There have been years that my Rosemary and Sage didn't die out, other years they did. Patsy, so pleased to read that your mum is improving. Patsy hugs to both yourself and your Mum she and you will be in our prayers for a speedy recovery :). Your garden looks wonderful and I can see the huge amount of work you have put into it. I hope your garden rewards you with lots of lovely produce. On the 20th of this month we will be dismantling our garden beds here in readiness for our move into our new to us home where we will start again :). Lorna, I know you are excited and will be glad when you are settled into your new home. Thank you for your prayers for my mom. I'm glad your Mom is improving. That's good news. I'm sure it feels good to return to normal life a little bit--it's great you can get a little time in the garden before winter hits. We finally got a heavy frost last night. It looks as if the few remaining plants I had left in the garden are looking pretty sad now that the sun has fully touched them. I'm ok with that. I've been exceedingly blessed by this garden, and it's been nice to be able to open jar after jar, or defrost carton or baggie, and still have great meals. 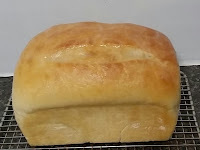 My husband is on a weight-loss journey, though, so we will really, really miss the fresh produce, and I've already watched my grocery bill go up a bit from buying fresh produce. It's worth it, as he's lost quite a bit (52 pounds at last weigh-in, counting since last May). Becky, That's wonderful that your husband has lost that much weight! We are supposed to get our first frost and possible freeze in the next few days so we are trying to get all the fall planting done before then. 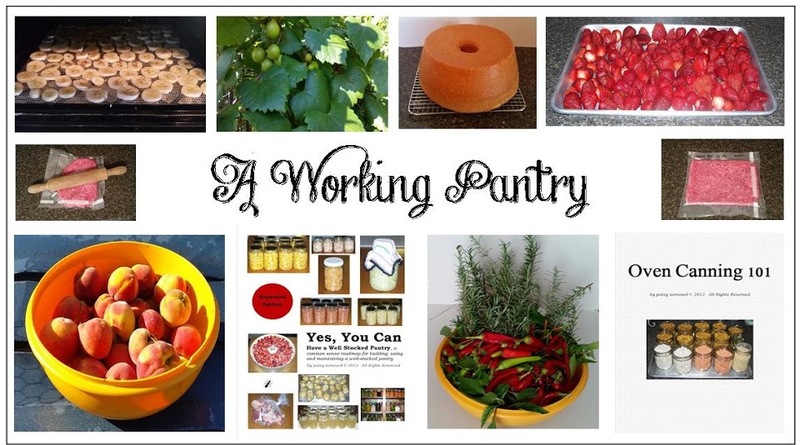 I love being able to eat from our pantry and oh, the money it saves us!! !